Once, just once, I would love to see a film about a group of misfit athletes who rise above adversity only to lose and lose miserably. I can imagine that this scenario would not make for the most interesting of viewing, but my god it would be refreshing not to know how a film will end, five minutes from the start. I suppose I have become jaded from having seen so many of these films, but it doesn't even seem like screenwriters are trying anymore. 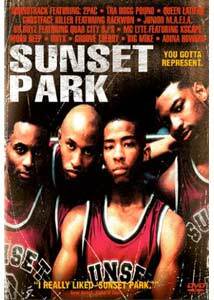 In Steve Gomer's Sunset Park, the coach knows nothing about basketball and yet, with her trust and admiration for a group of inner city high school students, she miraculously turn things around and the team has the season of their lives. Winning with a coach who knows nothing about the game? It certainly didn't work for the Bulls. Phyllis Saroka (Perlman) is a high school gym teacher who, in the recent weeks, has had her dreams of leaving the inner city crushed when her boyfriend leaves her heartbroken. Needing more money than she currently makes, Phyllis takes on the job of coaching a group of basketball players with an embarrassing losing streak. When Phyllis addresses the team at their first practice, we are introduced to the stereotypical group that includes Shorty (Howard), Busy Bee (Bonds), and Drano (Tanner), to name a few. As is to be expected, the team has issues with a female coach and the individualism that has caused their losing streak grows into something uncontrollable for Phyllis. At the end of her rope, she decides to connect individually with the players and hopefully turn things around. On its surface, Sunset Park has the ability to be something sort of special. The characters are nicely crafted in the way that each of the players has an individual arc, something a most writers overlook. Yet this is also what drags the story down, as Phyllis' character is not nearly as well crafted as those of her players. In fact, I would assume that it was not the general intention to make Phyllis less likeable than her players, yet this is what occurs. In a sequence late in the film, Phyllis attempts to have a heart-to-heart with her most difficult player; this scene should inspire our animosity towards the player, but it's the coach who draws our displeasure. Sunset Park is a film about basketball, though a glance at the script would prove otherwise. The screenplay seems to know as little about the game as the coach it features. When Phyllis meets her players for the first time, as well as later in the film when the championship game comes along, Phyllis uses a coaching strategy that would lead any other team to lose miserably. The basketball sequences are flat and fail to excite in the way that the best sports films do, giving this outing a stale feel. Rapper-turned-actor Fredro Starr is a standout in his performance as Shorty, while the other actors each do a nice job in conveying the emotions and moral directions of their characters. On the other hand, Perlman turns in a less inspired performance as Phyllis. Perlman has the tough-natured New Jersey act down pat, but it feels out of place here. Image Transfer Review: Columbia presents Sunset Park in a full-frame image. It is slightly matted so very little information is lost, though the lack of widescreen support is disappointing. The muted tones come off nicely throughout. Sharpness and detail are good, though the film looks soft throughout, an effect that hampers the gritty nature of the film. The print used has no scratches or flaws. Audio Transfer Review: Presented in a Dolby Digital 5.1 mix, Sunset Park sounds as you might expect. The largely hip-hop soundtrack comes off nicely in the speakers as well as the .1 LFE channel. Dialogue is crisp and clear throughout, while the surround speakers provide nice ambience. Extras Review: Trailers for Sunset Park, Higher Learning, and Race the Sun are offered in full-frame transfers with Dolby Surround. Those expecting a gritty look at inner city high schools and their basketball programs will be disappointed in Sunset Park. The lack of widescreen support from Columbia is also a reason to avoid the disc.